First lightly toast the pistachio nuts, let it cool & then roughly chop them. Put the chopped chocolate, condensed milk, butter & salt in a heavy based sufficiently deep pan on low heat & stir to melt. Then add the chopped pistachio nuts & dried apricots to the melted chocolate mixture. Smoothen the top of the fudge. Let the fudge cool thoroughly & then refrigerate until set. 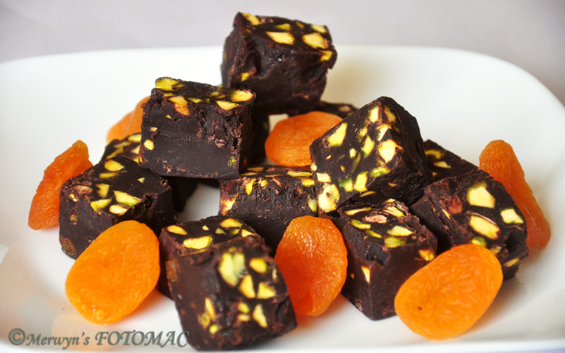 Cut the fudge into squares or desired pieces. Store in the fridge & serve at Christmas or enjoy whenever you wish.